Yeah, but: Make sure you have the right one. 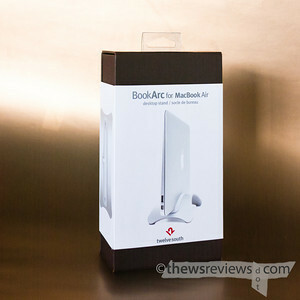 The Long Version: The BookArc from Twelve South has been around for a little while. There is one version that fits many different Apple laptops, including the previous generation of Macbook Air, by using interchangeable inserts within the same frame, and there's also a model to fit the now-obsolete iPad. The current 11" and 13" Air laptops – the October 2010 release – need their own specific model of BookArc that's tailored specifically to the thickness of those machines. While they have much in common, my experience is only with the one for the Air. 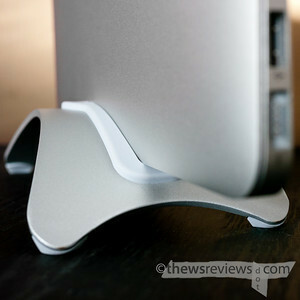 The BookArc itself is quite simple: it's a curve of steel with four little rubber feet and a rubber-lined fajayjay that the laptop slots into. The Macbook is held vertically, snugly but gently, with a footprint that's much smaller than what a horizontal laptop would take. The idea behind this vertical hold is that the laptop can be used in "clamshell" mode, which just means that the lid stays closed while the laptop uses an external monitor and keyboard – it has nothing to do with Scientology. Unfortunately this is a good solution to the wrong problem. It's still clumsy, with the computer needing to start open, and then the laptop needs to be closed and moved around with all of the cables in place. Not tremendously elegant, and the reward for managing it with the Air is to use an underpowered laptop as a desktop computer. That's not much motivation if you ask me, but it's hardly the BookArc's fault. A more powerful computer, such as any non-Air Macbook made in the last two years, might make this more useful. My bookarc is simply a reserved parking space that lets my pretty little Air take up less room on my chronically over-crowded desk while hooking up with its power supply. The fancy stand could conceivably be replaced by just about anything from a pair of bookends to a plate rail, but the BookArc does it with style. A simple job done well is all that I ask of it, and it delivers. And who knows? 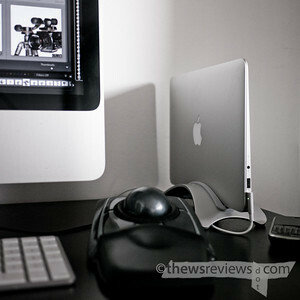 If my iMac does fold up its tent, I can always run my Air in clamshell mode for a day or two.